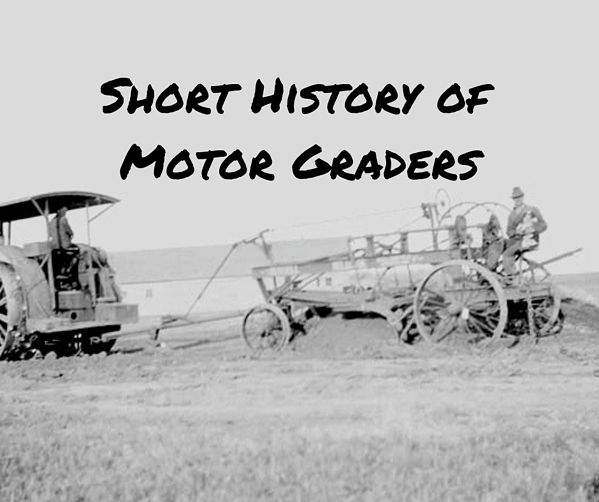 The earliest graders (also known as motor graders, road graders, maintainers, and patrols) were quite literally horse-powered -- they were pulled by a team of horses, oxen, or mules. This type of grader was developed by J.D. Adams in the late 1800s and introduced to the world as “Little Wonder” in 1885. This particular grader was a horse-drawn, two-wheel design with a fixed blade but wheels that could be angled to the side. The image below shows a slightly different model made by Jenkins. The next major step in the development of the modern grader occurred in 1896 with Adams’ design Road King. This particular grader had four wheels which were steel (earlier models used wooden wheels) and could lean in either direction. In the early 1900s, graders were also being pulled everything from steam tractors to crawler tractors. Since graders were still being pulled, more power for pulling meant that manufacturers could create larger, heavy graders. The next stage of evolution was the ability to be self-propelled. 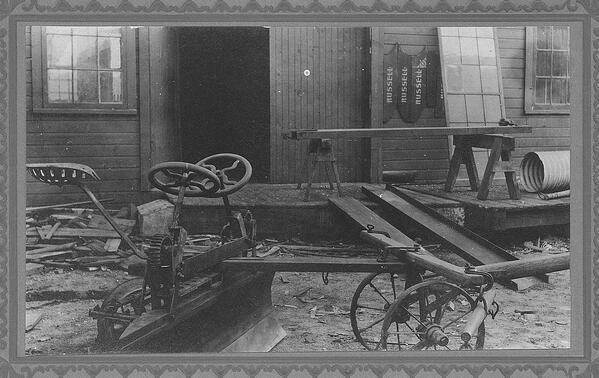 The leader in this innovation was the Russell Grader Manufacturing Company. They released the Motor Hi-Way Patrol No. 1 in 1919, which was used a modified version of an Allis-Chalmers tractor. The use of a tractor to form the foundation of a motor grader was soon adopted by other grader manufacturers and remained a popular approach for many years. 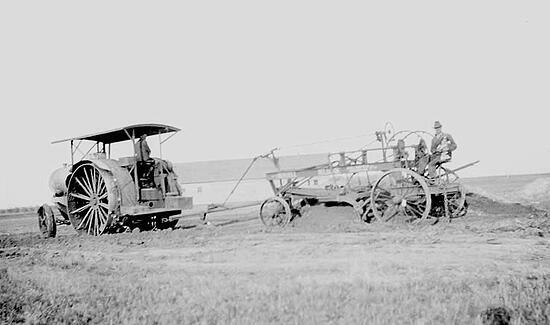 In some cases, the blade was added as an attachment to a self-propelled tractor (which, early on, could mean steam or engine powered). In other instances, a steel grader frame with blade as added. Note that the term “motor grader” was adopted when graders were given engines. In 1926, tracks were introduced by Russell by using a crawler tractor (of the Caterpillar type) as the foundation for the motor grader. 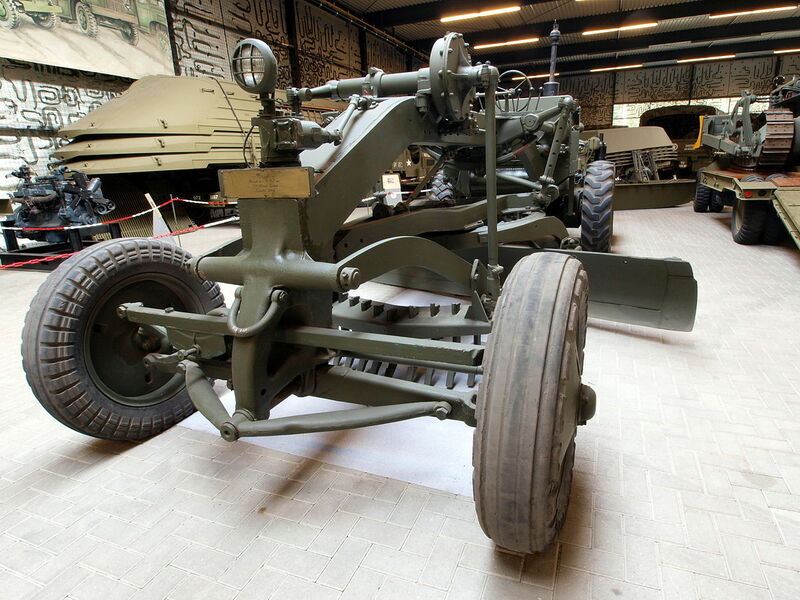 As with earlier designs, a steel grader frame and blade were fitted to the crawler tractor. The earliest adjustable blade graders made use of a rack and pinion hand crank design to for making blade adjustments, as shown in the image below. In the 1920s, manufacturers began to implement mechanical power controls to make the adjustments easier. In later years, blades would be hydraulically controlled rather than mechanically controlled. Caterpillar purchased Russell in 1928, which led to a major change in how motor graders were designed. 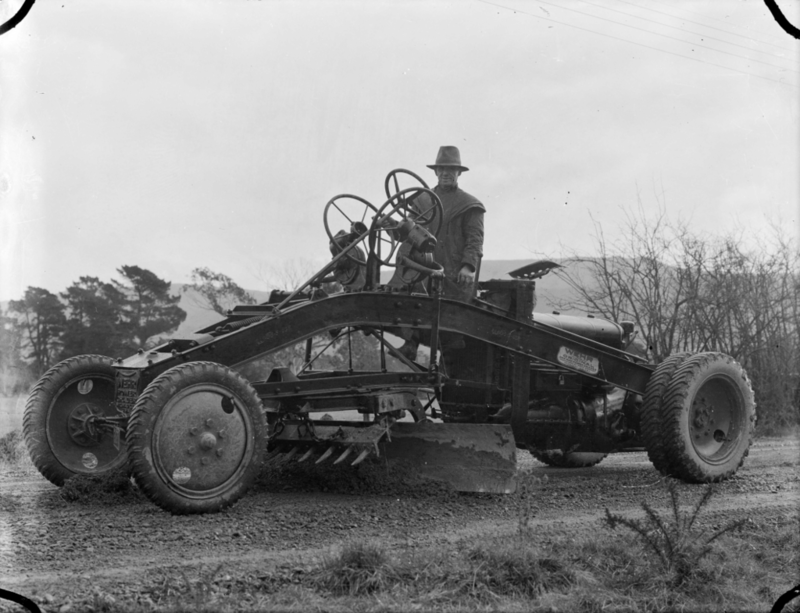 The tractor and grader were integrated into a single design, which meant that the grader blades were no longer an addition to a basic tractor. This approach formed the basis of the Caterpillar Auto Patrol, later renamed the No. 9 Auto Patrol. In 1938, Caterpillar released their diesel-powered model, the No. 12 Auto Patrol. In the 1960s, the first truly large graders were released followed by hydraulic controls and articulating bodies in the 1970s and turbocharged graders in the 1990s. As other advances in construction equipment came forward, many were implemented on graders (e.g., telematics, GPS, grade control). They remain an indispensable part of fleets around the world.